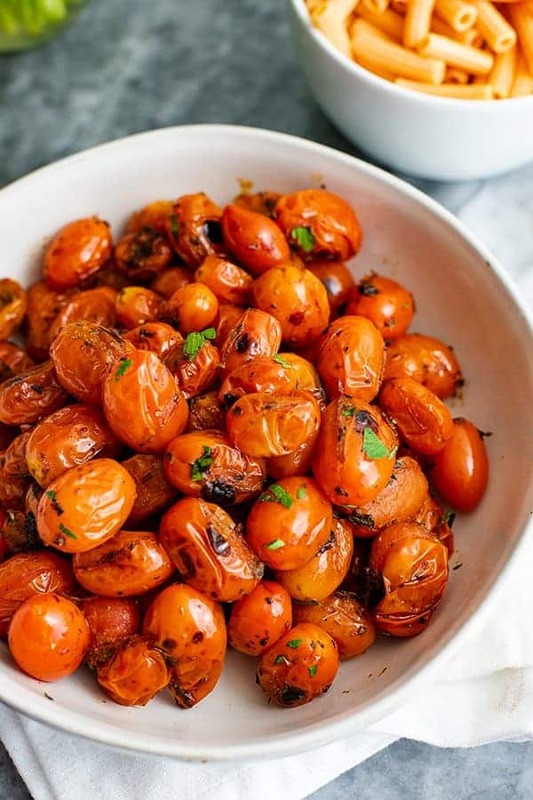 This recipe for 5 minute blistered tomatoes is the perfect summer side dish and is so simple to make! 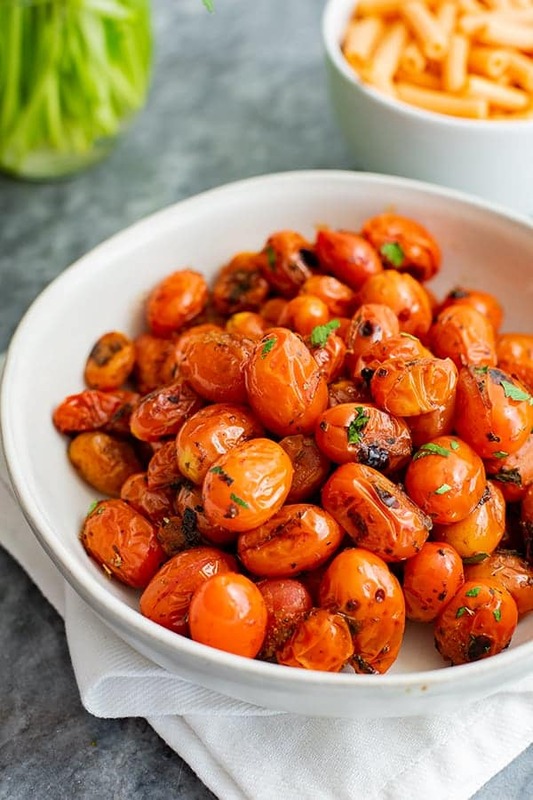 Vegan, Whole30, paleo, gluten-free and dairy free these blistered tomatoes are perfect for weeknight dinners or dinner parties! Every summer I get a little crazy when organic tomatoes are in season (and finally on sale)! I usually buy 2-3 pounds of tomatoes at a time to add to pesto zoodles or to eat with my low carb pasta! 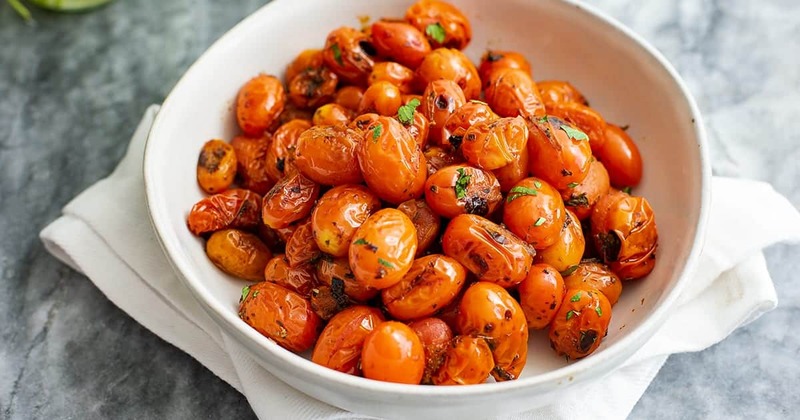 Since these blistered tomatoes don’t take much time and can even be made on the grill, this is clearly going to be my new go-to method for when I have cherry or grape tomatoes on hand because I love the taste and texture of the blistered tomatoes! The key to making these blistered tomatoes is a very hot cast iron skillet (affiliate) (or a really good quality non-stick skillet), avocado oil and fresh tomatoes! I have a confession. I owned our cast iron skillet for 3 years before ever getting brave enough to cook with it. I thought that cleaning it/the upkeep would be difficult, so I just never even tried. I’m seriously so mad at myself for this. The cast iron skillet has got to be one of my favorite things in the kitchen now and I rarely cook with anything else. This is because the cast iron skillet distributes heat very well to my food, and once it’s seasoned, it’s a breeze to clean! But don’t fret, if you don’t have a cast iron skillet, you can use any non-stick skillet you have. The key is that you want to be able to let the pan get hot on the stove (or grill), and I’m not confident that a non-stick pan would be ideal for this. 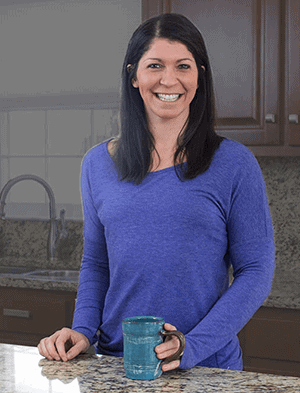 If you aren’t into cooking indoors in the summer, that’s cool! 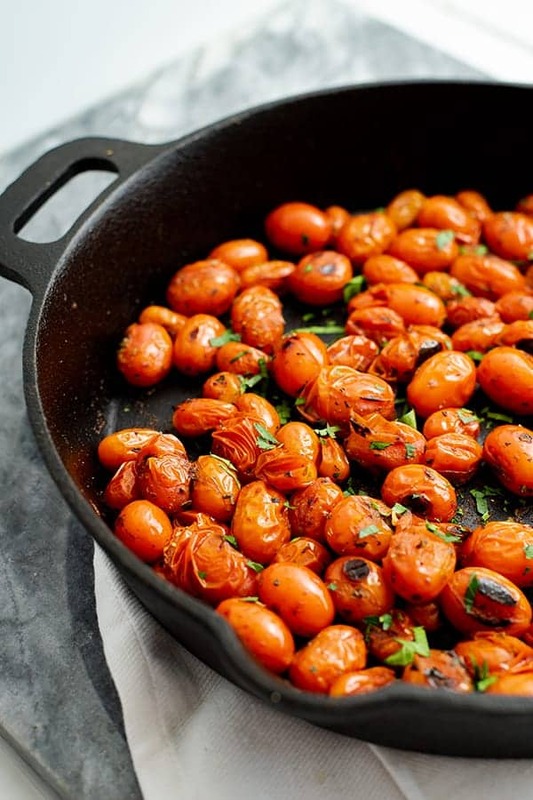 You can also use the cast iron skillet on the grill as well (since it can withhold the hot temperatures) so you can make these tomatoes even if you are grilling out! Avocado oil (affiliate) Since the oil will be going into a pan that is already very hot, it’s important to use an oil that can withstand the high heat. 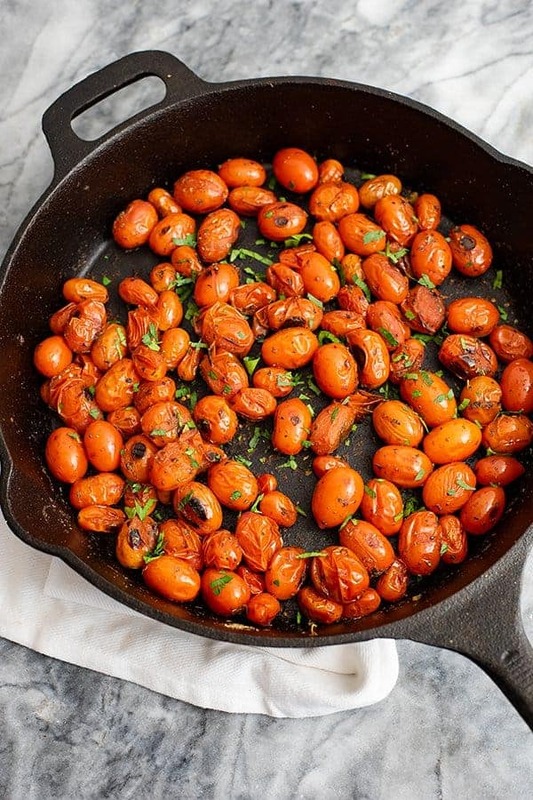 Again, the key to these blistered tomatoes is the cast iron skillet being hot before you add the oil or the tomatoes by pre-heating it on the stove. To do this, you will want to let the skillet sit on the stove over medium heat for about five minutes to heat up before you add the oil and tomatoes. Don’t skip this step or you will have hot tomatoes (with no blistering) and you will probably be disappointed! Also you will want to make sure you let the oil get hot in the pan before you add the tomatoes. I really believe the hot oil starts the blistering process, so don’t just add the oil and immediately add the tomatoes. Take a minute to distribute the oil around the pan with either a silicone brush (affiliate), or by carefully rotating the pan (remember to use a oven mitt if you are using cast iron since the handle gets hot). I like to keep my recipes as simple as possible. 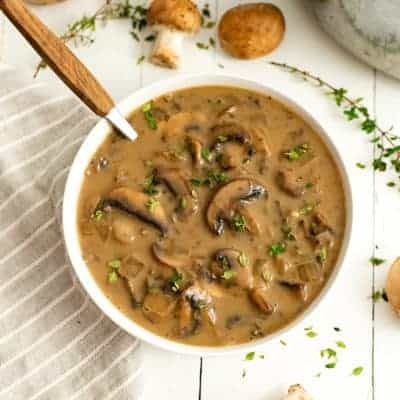 However, you can easily make this a little more involved by adding your favorite crumbled cheese, chopped nuts, dried or fresh herbs or even homemade dairy free arugula cashew pesto. 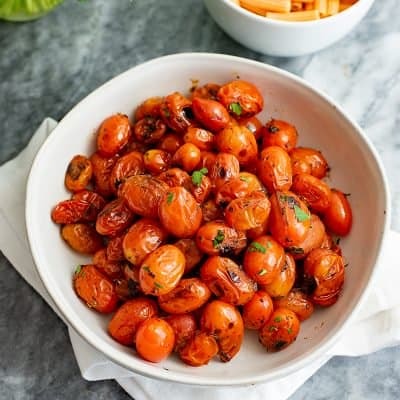 This recipe for 5 minute blistered tomatoes is a simple side dish perfect for summer tomatoes. 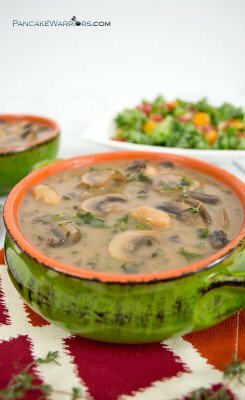 Vegan, paleo, Whole30, gluten free, grain free and so easy to make! 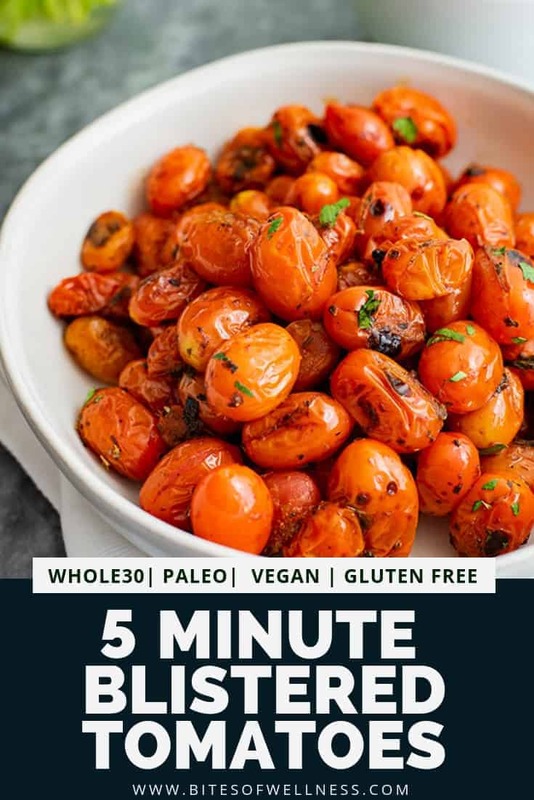 Allow the tomatoes to cook, un-touched for 3 minutes. Stir and cook 2 minutes more. I loved these. Will be making them again!